A gripping heart-in-your-mouth adventure told by Eve, a Tudor girl who sets out on a dangerous journey to change her life for the better. 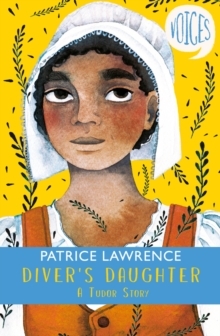 Voices: Diver's Daughter - A Tudor Story brings Eve and her mother, who was stolen from her family in Mozambique as a child, from the Southwark slums of Elizabethan London to England's southern coast. When they hear from a Mary Rose survivor that one of the African free-divers who was sent to salvage its treasures is alive and well and living in Southampton, mother and daughter agree to try to find him and attempt to dive the wreck of another ship, rumoured to be rich with treasures. But will the pair survive when the man arrives to claim his 'share'? Will Eve overcome her fear of thewater to help rescue her mother? In this thrilling adventure based on real events, Patrice Lawrence shows us a fascinating and rarely seen world that's sure to hook young readers. VOICES: A thrilling series showcasing some of the UK's finest writers for young people. Voices reflects the authentic, unsung stories of our past. Each shows that, even in times of great upheaval, a myriad of people have arrived on this island and made a home for themselves - from Roman times to the present day.